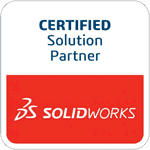 Springville, CA, February 27, 2013 – TEDCF Publishing, a SolidWorks Solution Partner and producer of interactive, multimedia training courses, today announces the availability of SolidWorks 2012: Advanced Parts and Assemblies. The course has over 7 hours of instruction that teaches advanced topics in the part and assembly environments. David Melvin, PE, the author of the course, demonstrates many skills, including creating custom configurations, using equations to drive part modeling, designing and managing assemblies, multi-body modeling and much more. The course is the second part in a four part series of courses for SolidWorks 2012 that will be released this year. It is currently available in three formats: DVD, direct download, and through the TEDCF Streaming Video Service. The Lesson Player has several customizable features designed to meet user needs. Users can slow down or speed up the video playback rate, which allows the user to learn at their own pace. When the user closes the Lesson Player it will automatically open to the same place in the course, so bookmarking is automatic. Hotkeys are available to pause, play, review, and go to the next lesson, and it has a search engine that helps users quickly find lessons. Visit SolidWorks Parts and Assemblies 2012 to learn more and watch sample lessons.